What is most disgusting about what former president Jimmy Carter said this week is not so much that he said it, but that those of Carter’s mentality consistently engage in such reprehensible specious reasoning. What Carter engaged in is a logical ad hominem fallacy, which is literally an “argument against the person.” This tactic is employed frequently by those who, in order to discredit their adversaries, seek to minimize their argument by making unsubstantiated accusations or allegations against them in order to redirect attention to the adversaries themselves, rather than the argument. By making the adversaries the focus with an accusation, the validity of their claim or premise is discredited since their argument is inextricably linked to them. The construct of the argument looks like this. Person A makes claim X. Regardless of veracity, an objection is made against Person A. Therefore claim X is false. Even more precisely, this version of the ad hominem fallacy is argumentum ad personam. This device is intentionally used to belittle or insult an opponent in order to retake the offensive and place the opponent on the defensive. Hence, it becomes a verbal misdirection to make the opponent the center of the argument, rather than the issue at hand; something akin to a magicians’ trick. Enter Carter center stage. In order to mitigate the disastrous polling for “Obamacare,” and the spectacle of Congressman Joe Wilson’s shout at the President, “You Lie!” and the massive demonstration in Washington on September 12 against totalitarian government, Carter makes an accusation “against the person.” The supposition is that the voices of dissent and the strength of the valid arguments against the White House agenda, are negated by the accusation. Not only is this logically fallacious, but it displays both the arrogance and ignorance of those who engage in such behavior. Ignorance, for it presumes stupidity on the part of the American people, and arrogance because by so engaging, they simply sidestep the real issues underlying dissent. It usually is employed when logic fails. I have always maintained that the first person to call the other a name in a debate has lost the debate, and that’s what comes naturally to those with no ammo left, for they need to misdirect the argument. It’s not a new tactic, but seems to be used with increasing frequency, not just by the politicians in control today, but by the media. They suppose due to our presumed ignorance, we’ll discount the claims of dissenters while aspersions like “mob,” (NBC & MSNBC), “evil” (Harry Reid), and “Nazis” (Nancy Pelosi) are hurled at them. We see it regarding other issues as well, like the appellation of “homophobic” to those who oppose homosexual marriage regardless of their logical reasons for opposition. In this caustic political environment, it’s crucial to not only be aware of the ideology employed in transforming America, but to be wary and alert to the methodology they employ to manipulate public perception. 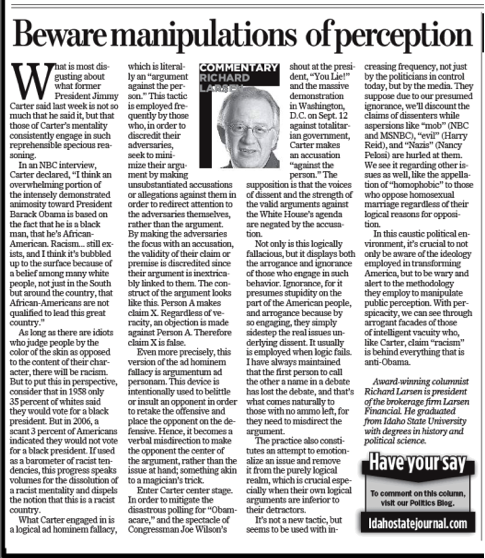 With perspicacity, we can see through arrogant facades of those of intelligent vacuity who, like Carter, claim “racism” is behind everything that is anti-Obama.